This allows Sonic to build up enough speed to defy gravity and soar through the air. The faster the player goes the more stunning the results. This adds a degree of & to the speed. This rush is pleasurable even after the player has mastered the game, making the games ‘timeless’ . Modern games contain such curvy sections. However, the curves are implemented as scripted sections, causing the rush to lack the same impact. Much like the Sonic the Hedgehog games, Skateboarding allows for a thrilling sense of speed. Skateboarders utilise this speed to overcome gravity. The most obvious example of this is the half-pipe ramp. By building up enough speed, the curved structure of the ramp launches the skateboarder into the air, allowing him/her to momentarily defy gravity with a great level of spectacle. Sonic must be running at top speed in order to cross the curve. Doing so will send Sonic upwards, just like a skateboarder on a half pipe. The upwards motion is brief, as gravity almost immediately pulls Sonic back down. Despite this, it results in a sudden jolt of speed that creates a ‘rush’ for the player. As gravity works to bring Sonic back down, it connects to the player’s understanding of real world physics. This allows the act of Sonic being propelled in the air to be impressive even though it is brief, as the player knows that Sonic has achieved an impossible act. If the player is travelling at over-clock speed, Sonic will be propelled up into the sky, often landing in a different part of the level. with Sonic often being propelled to new areas. A sharper jolt of speed, which creates a more satisfying ‘rush’. A sense of spectacle as Sonic is propelled to an impressive height. The pleasure of exploration, as Sonic lands in area that may not be normally accessible. As different speeds produce different results, an opportunity for player choice is created, as the player has a choice between going a high or very high distance depending on which speed s/he uses to cross the curve. 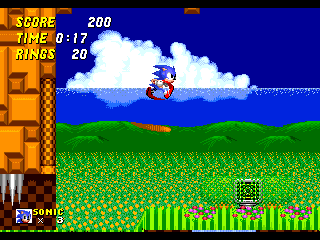 As Sonic is generally running at normal speed, the curves rarely aid progression through the stage. In many instances, the curve may be placed in an opposite direction of the goal and so can serve to hinder progression. Despite this, the curves hold much appeal, which can be attributed to the increased acceleration that they produce: Just as with the skateboarder, the sudden spike in speed creates a brief but satisfying jolt of adrenaline. are in an opposite direction to the goal. Sloping structures are another common feature of skateboard parks that also occur in the Mega Drive games. They take two forms: Steep slopes and down hill tubes and steep hills and springs. Steep slopes allowed Sonic to use gravity to his advantage. By running on a slope, gravity provides a weighty push, propelling Sonic at a frighteningly fast pace. As Sonic runs down, the force of gravity is gradually weakened. This creates an exceptionally thrilling sensation of speed. The speed is so intense that the camera may fail to keep up. 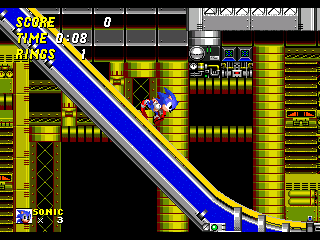 Sensibly, no obstacles follow immediately after, which prevents the player from unfairly taking damage due to the camera not being focused on Sonic. ▲ Chemical Plant Zone contains an especially memorable slope. The slope causes Sonic to run so fast that, for a few seconds, the camera fails to keep up. Due to the effects of gravity, a steep hill is often difficult to climb, as Sonic is pushed backwards before he reaches the top. A spring placed at the bottom of the hill gives him the push he needs to be speeded to the top. In effect, the spring allows the steep hill to function like a slope. The effect, however, is more visually impressive, as it allows Sonic to achieve an act that is ‘impossible’. These skateboard-like sections explain the lasting appeal of the Mega Drive games. Even after a skateboarder has mastered a half pipe or a slope, the rush it produces will motivate him/her to repeatedly attempt the stunt. 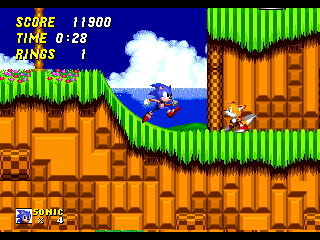 In the same way, after a Sonic player has mastered the game, the adrenaline rush retains the appeal of replaying levels. In Modern Sonic games, curvy sections occur frequently. The curves are much larger than their 2D counterparts, which intensifies the impact. (1) The sections lower player control The player simply has to enter the section and it automatically occurs without any input from the player. This weakens the adrenaline rush, as the player is reduced to being a viewer instead of a ‘doer’. (2) The sections are too automatic The sections usually function to catapult Sonic from A to B, as they are always preceded by a speed pad that ensures Sonic enters the curve at over-clock speed. If the player avoids the speed pad, s/he simply won’t be able to progress. Hence, the process of reaching an over-clock speed becomes automatic and the player no longer has to search the stage to find a device that will produce the necessary velocity. This makes the curve less rewarding, as the player no longer has to ‘work’ for the rush, which causes it to be taken for granted. (3) The sections lack realism As the speed pad allows Sonic to automatically cross the curves, the player is not exposed to the effects of gravity. This prevents the curve from drawing on the player’s experience of real world physics, which weakens engagement. ▲ No work is required to cross the curves. The player simply has to step on the speed pads. (1) Remove the automatic quality of the curve sections. This can be achieved by removing the speed pads that come before the curves. (2) Make the curve sections respond to variations in the player’s speed. If the player is travelling faster, they should be sent flying higher and land in a different part of the level.